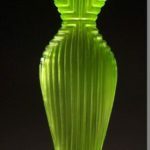 Todd McClure’s stylized glass female forms are like dresses that are defined by the body they adorn. 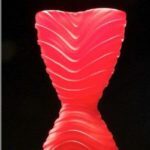 There is a delicate contrast, between cold, brittle glass and soft flexible fabric. While fashion itself is a temporary cultural phenomenon, changing from season to season, glass, once formed, can last for thousands of years.